The ban goes into effect for retailers larger than 10,000 square feet on July 1, 2019, and all other retailers on January 1, 2020. The fee is 10 cents for a paper bag at all retailers larger than 10,000 square feet. Smaller retailers have the option to charge a minimum of 10 cents for a bag, or simply build the price of paper bags into their costs. The purpose of the fee is to trigger behavior change. In cities where customers are not charged a bag fee, the number of people bringing reusable bags shopping with them remains low. We do not want to push consumers from one type of single use bag (plastic) to another (paper). The idea is to encourage people to bring reusable bags. In Portland, where no bag fee was implemented, the use of paper bags increased by 491%. What is a "reusable" bag? Unlike many other cities, Lake Oswego will not allow thicker plastic bags to be sold as "reusable". We join McMinnville and Salem in mandating that all reusable bags sold in the city be made from non-plastic materials. As many people are aware, plastic bags are in the top 5 items of collected marine debris. On Oregon coastal cleanups, plastic bags found on our public beaches can be traced back to Willamette Valley shops. They pose hazards to wildlife, and create litter alongside road, public spaces, and natural habitats. Alternatively, when plastic bags make their way to a landfill, they still pose a hazard. Special cyclone fencing is in use at Coffin Butte Landfill, where Lake Oswego's waste goes, to trap errant plastic bags. Once a week, a crew goes out to clean the bags out of the fencing. The City will rely on a complaint driven system to Code Enforcement. Retailers not complying will be issued a warning for their first violation, $100 fine for their second violation, and $250 fine for each subsequent violation. How Can I Get Reusable Bags? I don't want to have to buy anything. The City is working on a few options to provide free bags to residents. We will have bag drop off/pick up boxes at City Hall, ACC, the Farmers Market and potentially other locations where residents can drop off bags they don't need for others to pick up and use. We are also working with an organization who may provide a free reusable bag to every home. 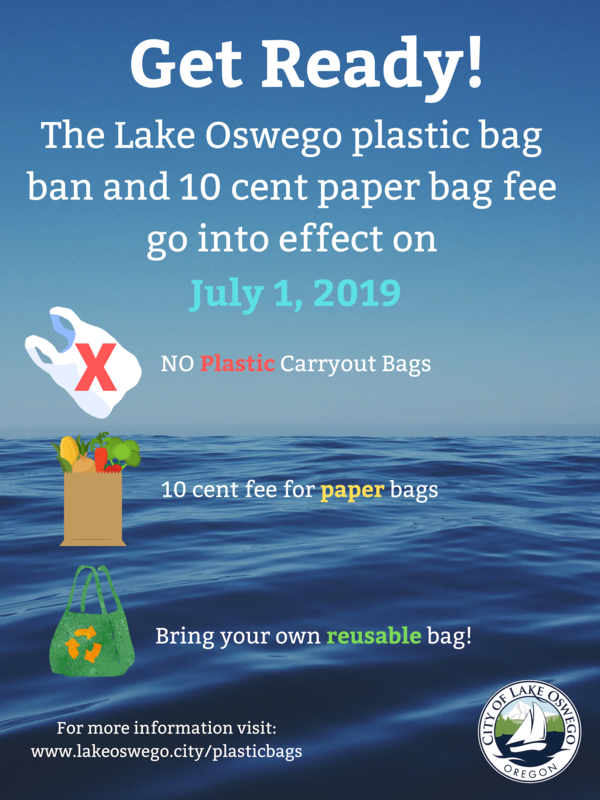 We hope to continue to provide avenues for a bag sharing program to ease the burden on all Lake Oswegans, whether that is based on cost, or simply on forgetfulness. I've Heard Reusable Bags are Gross and Full of Germs. Is this true? Supermarket baggers do not like handling filthy bags any more than you do. Keeping bags clean is as important as keeping your refrigerator clean, washing your meat and produce, and practicing safe food handling. Some bags are easier to clean than other- cotton or canvas bags can be easily washed, while the mixed blend nylons and polypropylenes can get pretty grimy. They can be cleaned with soap and water, though stains may persist. Please note that this bag ban does not include plastic bags provided to wrap meat or contain produce. The primary reason for this is food safety. Can I bring whatever bag I want to the store to avoid paying for a paper bag? Even plastic bags? Absolutely. If you have stockpiles of plastic or paper bags, reuse them! 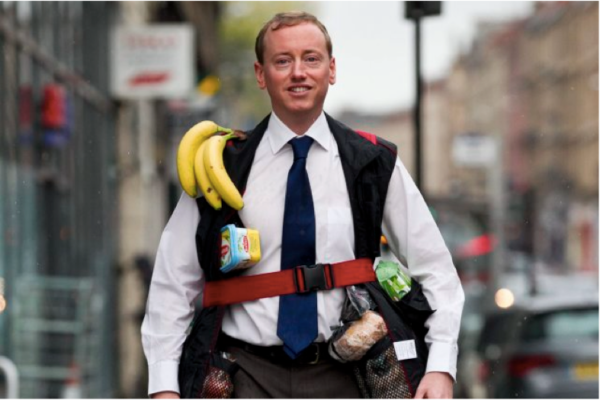 You can use any type of bag, or even carry everything out in your arms. Whatever works for you. The pass through fee ONLY applies if you take a paper bag at the checkout. I use plastic bags as dog poop bags and to clean the cat box. What should I do now? Fortunately or unfortunately, plastic bags will not disappear from your life. Reuse your plastic produce or meat bags for pet waste. If you get a newspaper, use the plastic newspaper bag. Dog poop bags can also be purchased in enormous quantitites at a low cost from Amazon, and many of these are even biodegradable. Dog poop bags will still continue to be available in Lake Oswego parks and along pathways. Why do we not want to use paper? Isn't it recyclable? In theory, yes. However, for decades we were shipping pulp and paper to be recycled in China. This is no longer an option. 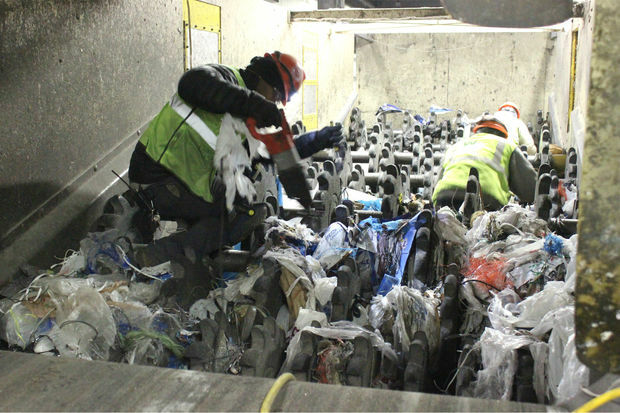 With the closure of many pulp and paper mills domestically and a very low price for recycled pulp, a lot of paper is being stockpiled, or even landfilled, in the absence of a domestic paper recycling market. Paper is also more expensive for retailers than plastic. Thin plastic bags can be trucked to stores in enormous volumes, while paper bags take up more space and cannot be shipped at the same volume. Plastic, as a fossil fuel byproduct, is also much cheaper to produce than a paper bag. This ordinance would mandate that all paper bags be at least 40% recycled content, which is a good environmental option, and paper does biodegrade much more easily than plastic. From a waste perspective, paper is a better option as it is not a persistent pollutant. However, the cost to retailers to provide them is high. No bag is free, but paper bags are more costly than plastic.